For many years Nicola has worked freelance designing silverware for the prestigious Edinburgh Jewellers, Hamilton & Inches. Most notable designs include The Six Nations Rugby ‘Triple Crown’ Salver, Ceremonial centrepiece and sticks in the Millenium Collection for Bute House, lidded quaichs and stone set candelabra for the Silver Trust Collection at 10 Downing Street. She discovered botanical illustration via a study of calligraphy and an interest in illuminated manuscripts. In 2009 Nicola graduated with Distinction from the Royal Botanic Garden Edinburgh with a Diploma in Botanical Illustration. Nicola is adding new paintings to her portfolio and continues to develop FloralWorks designs as well as tutoring a weekly Art Class in Marchmont and Botanical Illustration at the Royal Botanic Garden Edinburgh. 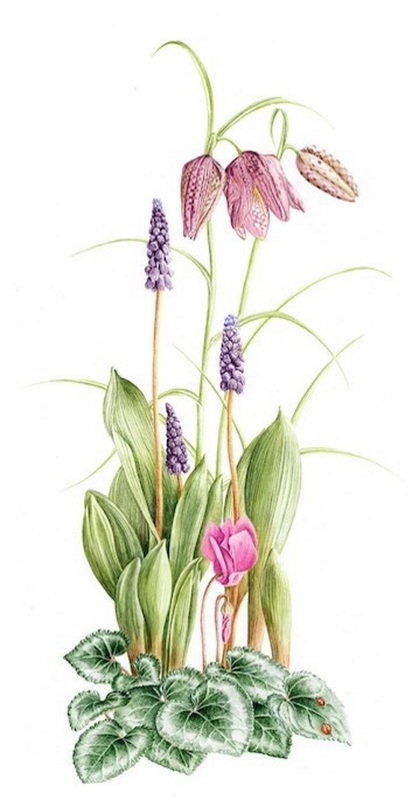 Jan is a resident of Perthshire and gained a Diploma in Botanical Illustration from the Royal Botanic Garden Edinburgh (RBGE) in 2014 after a lifetime interest in illustrating wild flowers. Like so many people who love plants, she has also had a completely different career as a social worker. She also has a lovely but ever-increasingly large family. Since completing the RBGE Diploma course she has exhibited at the ESBA annual exhibition and with the Perthshire art collective ‘Fusation’ at The Bield at Blackruthven near Perth in 2014 and 2016, and at The Byre Theatre, St. Andrews in 2017. In 2017 has exhibited at the annual BISCOT (Botanical Images Scotland) exhibition where I gained a bronze medal for a series of Geraniaceae paintings. Jan is the current secretary of ESBA and holds an RBGE Certificate in Field Botany, gained in Belize. She has even painted with an international group of illustrators on a boat on the Amazon in the footsteps of the renowned artist Margaret Mee! Bill Phillips took the Certificate course in Botanical Illustration at the Royal Botanic Gardens in Edinburgh in 2013, winning the prize for best student portfolio. This was an interesting and enjoyable experience and was followed by the 2-year Diploma in Botanical Illustration, graduating with Distinction in 2015. Bill continues to develop a strong and individual watercolour style, focusing on botanical subjects, but with still life and landscape also represented. Currently, he is leading workshops in botanical drawing and watercolour for beginners at the Birnam Institute. Exhibitions include the RBGE, BISCOT, the Edinburgh Society of Botanical Artists, Dunkeld Art Exhibition and the Perth Art Association at the 64th and 65th Annual Exhibitions and the 2017 and 2018 Arts Festival Exhibitions. Bill was a short-listed artist for the National Open Art Competition 2017. His painting Beech Hedge at Meikleour was accepted for the 7th RSW Open Summer Exhibition 2018.